More often than not, children are admitted to the hospital unexpectedly due to a sudden illness or trauma leaving behind their blankies or a favorite stuffed animal. 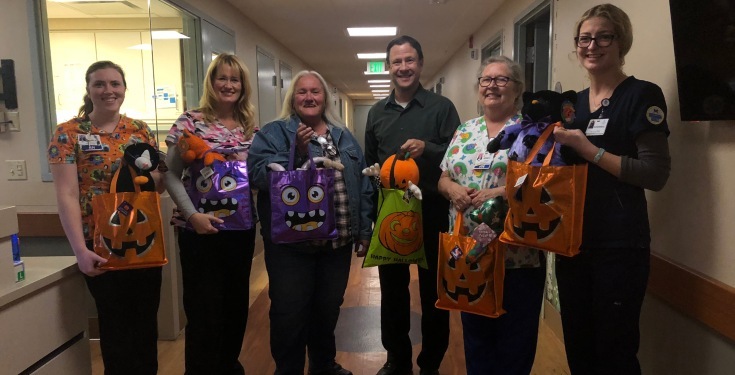 Polson resident Nancy Hausermann and Safeway in Polson stopped by the hospital on October 25 to deliver Boo Bags for the children in our pediatric inpatient unit and pediatric ICU. In the past Nancy had donated gift bags to Coalition for Kids in the Polson area, but recently she was diagnosed with Breast Cancer and she began to think about all the kids who are in the hospital fighting their own battles. While she still gives Boo Bags to children in the Polson area, she has increased her fundraising efforts to include hospitalized children. Being able to provide new toys to kids in the hospital helps to comfort them and let’s them participate in the holiday even if they can’t be home. Nancy raises funds herself along with small fundraisers in the community. Safeway in Polson donates and provides space in the store for Nancy to raise funds. Thank you to Nancy, Safeway in Polson and all the donors who will bring smiles to the children at Community Children’s in Missoula.